To lay apostolate members: The Church needs lay witnesses to the Gospel's saving truth and transformative power. Advance the Church’s mission by ensuring the temporal order is permeated by the Spirit and ordered to the Kingdom. Bring the Lord’s presence to people on the peripheries, not just by charitable assistance but also by practical concern for human growth. Helping the poor is necessary but not enough. Work harder in human promotion, so everyone can know the joy and dignity of earning their daily bread and supporting their family. Support couples and families in fulfilling their mission in Church and society. The family is the basic unit of society and the first school where children learn values that enable them to shine with goodness, integrity, and justice. Promote formation of lay faithful through catechesis and spiritual direction. Work with your pastors, placing your talents at the service of the Church. Draw inspiration and strength from the Eucharist, where love, the soul of the apostolate, is communicated and nourished. Homily at Korean martyrs' beatification: "Who shall separate us from Christ's love?" (Rom 8:35) Christ has not only risen and ascended but also united us to himself and given us eternal life. Christ's victory is ours! We celebrate this victory in Paul Yun Ji-chung and his 123 companions who lived and died for Christ and now reign with him in joy. “Neither death, life, angels, principalities, present, future, powers, height, depth, nor anything else, will be able to separate us from God's love in Christ our Lord” (Rom 8:38-39). The martyrs' victory and witness to God's love bear fruit today. The history of the Church in Korea tells us much about the importance, dignity, and beauty of the vocation of the laity. Jesus asks the Father to protect us from the world, not take us out of it. Martyrs show us how to be a leaven of holiness and truth, salt of the earth, light of the world. They and other Christians had to choose between following Jesus or the world; they bore persecution and sacrificed possessions, land, prestige, honor, and even life, knowing Christ alone was their treasure. The world challenges our faith and asks us to compromise, but the martyrs call us to put Christ first and to see all in relation to his Kingdom; they challenge us to think about what we'd be willing to die for. The martyrs also teach us charity. Their pure witness to Christ, accepting the equal dignity of all the baptized, led them to challenge social structures. Their refusal to separate love of neighbor from love of God impelled them to attend to others' needs. Their example speaks to us from societies where poverty grows, where the poor aren't heard, and where Christ asks us to love and serve him by tending to the needy. If we follow the martyrs' lead, we'll understand their freedom and joy. Their integrity, fidelity, charity, and solidarity inspire us all to work for a more just, free, reconciled society of peace where human values are protected. May their prayers help us persevere in faith, good works, holiness, purity, and zeal in bearing witness to Jesus! Hear Romans 8 music matching the pope's homily, like God is working for our good, and find more about that wonderful passage, here. Creighton: God refuted the proverb that complained that people were punished for ancestors’ sins. God’s judgment isn’t skewed by prejudice or guilt by association; neither should mine. Most didn't consider children important, but Jesus turned the tables. Children can have clean hearts and minds more easily than adults. Love of God and neighbor can help me be childlike. DailyScripture.net: The parents knew Jesus' healing touch. Jesus demonstrated God's love has room for everyone, including children. Do I show kindness to and pray for young people? 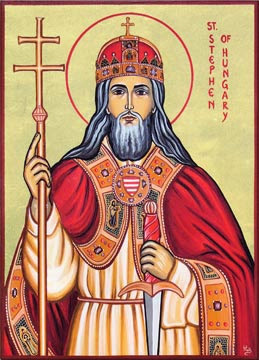 Universalis: St. Stephen of Hungary, king; see Catholic Encyclopedia, Wikipedia. St. Rock cared for plague victims, miraculously survived.